This bold dramatic design has a very modern corporate edge. With the block letters at an angle and the words slightly aligned, this definitely sends a strong message that Christmas has arrived! 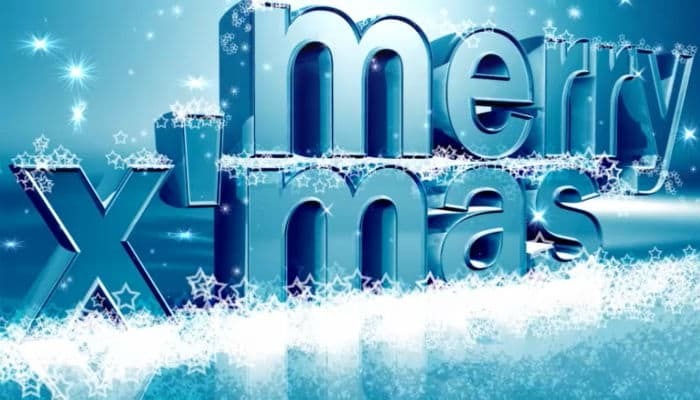 The letters are quite rounded in shape and give a 3D effect so that the words practically jump off the page to wish you a Merry Xmas. The image itself is a lovely shade of iridescent pale blue and the blue sky is dusted with a blanket of soft shining stars. These stars sparkle and gleam when the ecards are played to create a lovely effect. What makes the e Christmas cards for business all the more festive are the frosted white snowflakes draped around the words and also encrusted at the bottom of the words, delicately glowing. The stunning mirror like reflection of the words also looks very effective and makes the words feel large, driving the message home. These e cards are always a hit with the new innovative businesses that choose us, they feel it gives the message in a quirky and fun way! Here at Ecard Shack, we try to create as many designs to choose from as we can, from our large portfolio of corporate Christmas ecards, so that there is something for everybody. Please feel free to design as many of these as you like by simply registering an account with us today, completely free of charge.